Whispers in the Loggia: "Who Is Paul?" Before entering the basilica, the pope, accompanied by representatives of other Churches, walked in procession around the four-sided portico of the basilica: next to the Pauline Door, Benedict XVI lit the first candle of the brazier that will remain lit for the entire Pauline Year, until June 29, 2009. After him, the gesture was repeated by the ecumenical patriarch and the representatives of the other Churches. In conjunction with the celebrations of the Catholic Church, the Pauline Year was inaugurated today in Damascus as well - this city of the apostle's conversion - with the participation of all the Christian communities: Catholic, Orthodox, and Protestant. The inauguration of the Year was proclaimed, in the name of all the Christian communities the city, by the Greek Orthodox patriarch of Antioch, Ignatius IV, while the Greek-Melkite Catholic patriarch of Antioch, Gregory III, was in Rome at the basilica of St Paul. In Turkey, the modern-day location of Tarsus, the city of St Paul's birth, the Year was opened a few days in advance, on the 22nd. In Tarsus, as of today, there are officially no Christians or churches. For this year, permission has been requested for the use of the old church of St Paul, officially a museum, as well as many other churches in Turkey. "Who is Paul?" This is the question that the Pauline Year, in the words of Benedict XVI, addresses to us today. "Teacher of the gentiles, apostle and proclaimer of Jesus Christ", the pope recalled, "this is how he characterises himself in a retrospective look at the course of his life. But with this, our attention is not directed only to the past. 'Teacher of the gentiles' - this title is open to the future, to all peoples and all generations. Paul is not for us [only] a figure of the past, whom we recall with veneration. He is also a teacher, apostle and proclaimer of Jesus Christ for us as well. We have therefore gathered not to reflect on a history left behind forever. Paul wants to speak with us - today". "In the letter to the Galatians", he continued, "he provided for us a very personal profession of faith, in which he opens his heart to the reader of all times, and reveals the deep driving force of his life. 'I live by faith in the Son of God who has loved me and given himself up for me' (Gal. 2:20). Everything that Paul does begins from this centre. His faith is the experience of being loved by Jesus Christ in a completely personal way; it is the awareness of the fact that Christ has faced death not for some anonymous person, but out of love for him - for Paul - and that, as the Risen One, he still loves him. Christ has given himself for him. His faith comes from being transfixed by the love of Jesus Christ, a love that shakes him to his core and transforms him. His faith is not a theory, an opinion about God and the world. His faith is the impact of the love of God on his heart. And thus his faith is itself love for Jesus Christ". "This love is now the 'law' of his life, and in this very way it is the freedom of his life. He speaks and acts on the basis of the responsibility of love. Freedom and responsibility are here united in an inseparable way. Because he stands in the responsibility of love, he is free; because he is someone who loves, he lives completely in the responsibility of this love and does not take freedom as the pretext for willfulness and egoism". In the "search for the interior physiognomy of St Paul", Benedict XVI then evoked the words that Jesus spoke to him on the road to Damascus, "Saul, Saul, why do you persecute me? ", in order to highlight how in these words there is an "identification" between Christ and his Church. It is "the Lord himself", then, who asks: "How could you have lacerated my body? Before the face of Christ, this word becomes at the same time an urgent request: Bring us back together again, from all our divisions. Make this a reality again today: there is only one bread, because we, although we are many, are only one body". "We hope that the life and Letters of St Paul", echoed the ecumenical patriarch, "may continue to be for us a source of inspiration 'so that all nations may be obedient to faith in Christ' (cf. Rom. 16:27)". "The radical conversion and apostolic kerygma of Saul of Tarsus", he had said shortly before this, "'shook' history in the literal sense of the term, and moulded the very identity of Christianity". "This sacred place outside the Walls is without a doubt eminently suited for commemorating and celebrating a man who established a marriage between the Greek language and the Roman mentality of his time, stripping Christianity, once and for all, from any mental restriction, and establishing forever the catholic foundation of the ecumenical Church". 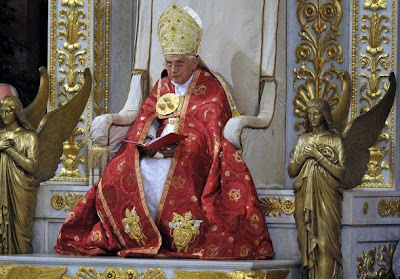 While this year's First Vespers for the dual feast of Rome's patrons was moved to St Paul's in deference to the special celebrations, in keeping with custom, the ceremonies shift in the morning to St Peter's, where the pontiff will confer the pallium on 41 new metropolitans. Tomorrow's solemnity also marks the 57th anniversary of Joseph Ratzinger's ordination to the priesthood.